Almyrida (also known as Almirida) is situated in the Apokoronas region to the east of Chania which is where most of our holiday villas are. This seaside beautiful village boasts a stunning sandy beach and many wonderful restaurants serving the freshest of seafood as well as traditional Cretan dishes. 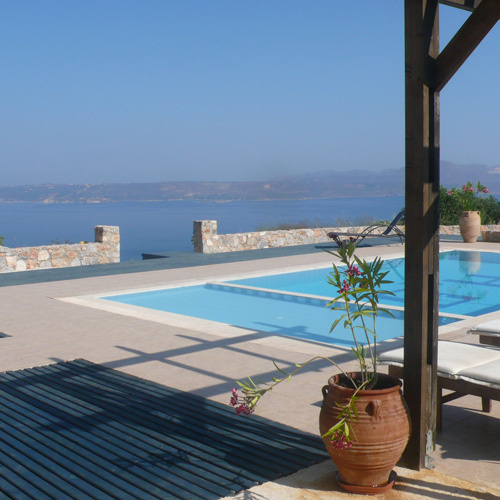 Many of our villas are within 10 minutes of Almyrida and are all fully licensed properties with private pools, meaning that you can expect a very high standard of accommodation at extremely competitive prices. Ilios House is a perfect choice for a couple looking for a peaceful and relaxing holiday in an extremely well equipped, 2 storey, house which overlooks a pool shared with 7 other small houses (NB - sunbeds are provided for the exclusive use of guests at Ilios House). There are glorious sea views across Souda Bay from the 1st floor balcony and ground floor terrace. Ilios House is close to tavernas and local shops in Kokkino Chorio (10 minutes walk) and Plaka (25 minutes walk). This very popular, well equipped villa offers modern amenities with traditional styling and furnishings; it will suit those looking for a more authentic Cretan style. There are furnished balconies and terraces with sea views, perfect for relaxing, around the villa. Car hire is not essential at this villa as it is located in the centre of the village of Plaka, within an easy stroll of the village’s tavernas, bars and mini market and only 15 minutes walk to the beach at Almyrida. The villa is being completely re-furbished for the 2019 season to provide a traditional villa which is also light and airy. The majority of the dark wooden furniture is being replaced with light coloured/painted furniture. Ideally located in a quiet spot only 10/15 minutes walk to the village of Plaka where you will find an excellent mini market and several tavernas; Villa Diktynna offers air-conditioned accommodation within a walled garden setting. There are countryside views towards the Akrotiri peninsula with The White Mountains as a backdrop. Low occupancy discounts are available at this villa. Located in a superb private plot above the village of Kokkino Chorio, Bay Tree Villa has far reaching views over the village to the White Mountains and across Souda Bay to the Akrotiri peninsula. The beautiful, tiled, infinity style swimming pool is surrounded by furnished sun bathing terraces which all have glorious views across the bay. Low occupancy discounts are available at this villa.